MINUTES FROM CHRYSLER PLANT in Bramalea and NORTHERN TELECOM - NORTEL - Dixie Rd. & Williams Parkway area - RUN don't walk to this great opportunity. This absolutely fabulous "Contessa" model was built by Poplar in 1977. You won't believe your eyes because it is better than new and is a must-to-see on your shopping list. The second owners have taken great care to preserve the care taken by the original owners, so you will be proud to take over this well-cared-for property. The second owners have added many extra features, as well - such as a custom built treasure/garden house. They just installed new shingles on the roof, have completely reno'd the regular bathrooms - and - they've added a basement apartment: 2 bedrooms, 2nd kitchen, and there is a huge living room with large windows, and an extra large bathroom, that is right out of a magazine. - Smoke-free. The DREAM KITCHEN is a masterpiece of design with built-in appliances including a Jenn-air cooktop. Ample cabinets and counter space surround the work area, and are fashionably done in up-to-the-minute "washed-oak" stain. Further enchanting the kitchen is an upgrade ceramic that is easy-on-the-feet and beautifully neutral, making it easy-on-the-eye. The generous eating area will accommodate a large gathering. The combination living-dining room provides adequate space to enlarge the table for special occasions, or for drawing guests closer together for formal events. New mirror entrance hall closet. Hall is 2-storeys high. Just a few steps down, you will find a less formal atmosphere and plenty of ambiance in the main floor family room with enclosed fireplace, a walkout to the professionally finished garden/patio area (with on-line gas), and plenty of space for a games table area, as well. Best use of space award for this area; also accessible from the side door laundry room, flanked by its own washroom, and an extra bedroom or study/den. Down a few more steps - just wait till you see what we have here! Perfect for office-at-home - complete with bathroom extraordinaire!!! 6-jet whirlpool type bath, for that tired young executive to have a grand relaxing soak, an oversize 5 foot separate shower stall to cool down after a frustrating day, 2 sinks and a ultra modern toilet... OR - the perfect NANNY - Granny (?) SUITE. (If the inlaws come to visit, they'll never want to leave.) All bedrooms are generous in size, and the master has an ensuite, and a walk-in closet with fresh air exhaust fan. There's plenty of storage, and a large cantina. This builder used plywood construction. There is central air, new central vac, upgrade broadloom, an efficiency furnace, new remote automatic garage door, and so much more. 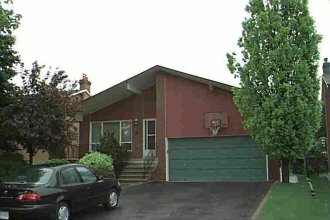 Quiet, mature area surrounded by parks, walkways, access to schools, and all major highways.